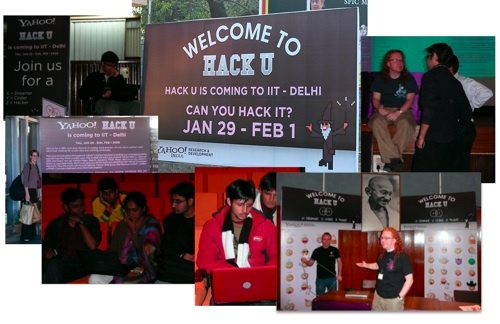 Yahoo India R&D to Host ‘HACK U’ for IIT Kharagpur Students ! Yahoo! India R&D will be hosting ‘HACK U’– the University Hack Day event for IIT Kharagpur students on campus between 17 and 20 March. Close to 250 students are expected to participate in this four day event of learning, hacking and fun, which is part of Yahoo!’s on-going commitment to nurture talent and innovation among today's student bodies. Conceptualized along the lines of Open Hack Day, Hack U provides a platform for the student community to develop and build applications using Yahoo! 's Open APIs (Application Programming Interface) like YQL and YAP, or even to create a new product concept itself. This novel concept provides students with the opportunity to work on product ideas, develop working prototypes in a 24 hour ‘Hackathon’ and eventually stand the chance to win cool prizes. The event will kick off with a series of hack-related presentations and tech talks by Yahoo! engineers followed by a non-stop 24-hour hacking session by the students. Praveen Ramachandra, Senior Architect at Yahoo!, will deliver the keynote address reinforcing Yahoo! 's vision around the need to deliver personally meaningful and relevant digital experiences to users of the Web. Over the course of the four days, students will be able to interact with Yahoo! web experts, receive hacking tips and hands-on exposure to cutting-edge applications and technologies. Hack U encourages participation from students through hack ideas and innovative concepts on shared research interests such as information extraction, parallel/distributed programming and other focal areas. Technology experts will also be conducting technical talks on Yahoo! 's Open Platforms including YUI, OAuth, YAP, YQL during the event. Open Hack Days started as an internal event that brought Yahoo! developers together. Overtime it has become a much-anticipated external event that is now held across Yahoo! offices around the globe. The annual event has Developer workshops with sessions led by Yahoo! on Blueprint, OpenMail, YAP, YQL and Yahoo! Social, and progresses to an overnight Hack Camp, concluding with demos, judging and award presentations. Open Hack Day enables talented developers to create better, more relevant and more social experiences on the Yahoo! network and beyond. The spirit of Open Hack Day is to leverage Yahoo’s open API’s and developer tools to create new applications. Bangalore is where Yahoo! has its second largest R&D center globally. Established 10 years ago, Yahoo! India R&D works with a mission to deliver product and technology innovation that create a significant business impact globally. Today, the centre employs a large number of Yahoos who are putting their passion to invent the internet of the future, and are engaged in end-to-end product development, from concept through launch. The research arm, called Yahoo! Labs, focuses on basic and applied research in the areas of next-generation search, advertising and large-scale computing systems. The organization has nurtured one of the most talented teams of scientists, researchers, architects, designers, developers, product managers and engineers who are are working together to develop innovative technologies, products and experiences that positively impact people’s lives. Bangalore centre is an integral source of intellectual property at Yahoo!. Over the last four years, Yahoo’s Bangalore centre has yielded a 50% average year over year increase in idea submissions for patent consideration. It has undertaken end-to-end development of more than 20 products providing best-in-class consumer experiences and online advertising products for both global and emerging markets. Some of its well-known products innovations are Yahoo! Cricket, OMG, Helium, Vertex, NGD Marketplace.